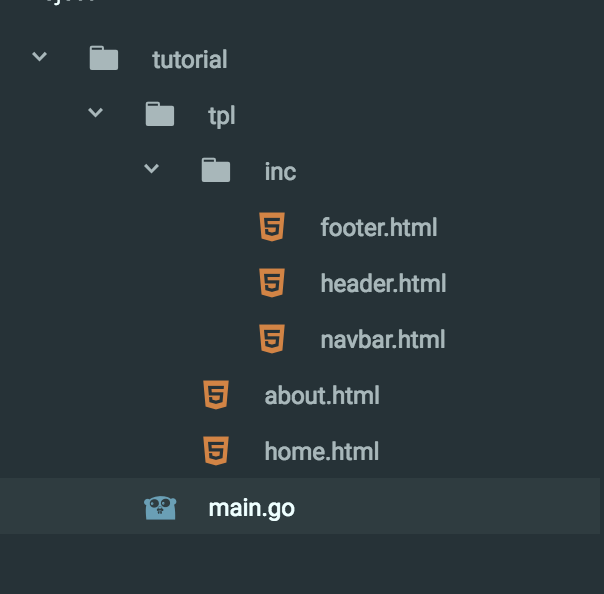 For this tutorial, I’ll use renderer package to render our HTML template. Lets create a directory tutorial` in your $GOPATH/src . Use go get to install the above-mentioned package. Create header.html, navbar.html and footer.html inside tutorial/inc . We are using bootstrap CDN to look cool. We are defining header, navbar, footer template as reusable code. Now we have our reusable template files, let’s create two templates, one for home and another for about page. Put these file inside tutorial/tpl directory. At line10 in main.go file we declared a rnd variable and inside init function, we assigned the variable using renderer package. In this case, we used ParseGlobPattern option to parse any .html file inside the tpl directory. Inside main function we declared two routes for home and about page. Inside home and about handlerFunc we used HTML method from render package and passed the template name in the third param. We are ready….. :D , run the app using go run main.go and go to localhost:9000 in your web browser. If you like the article don’t forget to let me know, hit the appreciate button and share the article with others. If you like my writings please follow me Saddam H.